(Athene cunicularia) The burrowing owl lives underground in tunnels. The owl pictured is Tremor. He was found in a backyard in Apple Valley. Tremor loves his mice and he charges out to get them when it’s feeding time. He is very vocal and thinks he is much bigger than he actually is. What does the Burrowing Owl eat? Wild Burrowing Owls are able to live for at least nine years, while owls in captivity can live over 10 years. How many Burrowing Owls can be born at a time? Females lay up to 12 eggs. Burrowing owls are distributed from the Mississippi to the Pacific and from the Canadian Prairie Provinces into South America. They are also found in Florida and the Caribbean islands. Burrowing owls are so named because they live underground in burrows that have been dug out by small mammals like ground squirrels and prairie dogs. 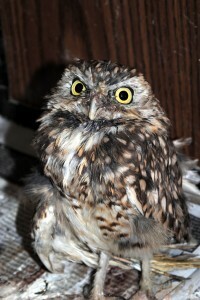 They are one of the smallest owls in North America. They stand about 7 1/2 to 10 inches tall with long legs and short beaks. They are diurnal and hunt day and night. They are considered endangered in Canada. Tremor – has a broken wing which did not heal properly. He came to us in 2007 as an adult. Someone found him in their backyard in Apple Valley. Tremor loves his mice and he charges out to get them when it’s feeding time. He is very vocal and thinks he is much bigger than he actually is. We make little caves for him in his enclosure out of small cardboard boxes, and he runs into his cave to feel secure. Rumble – male; cannot be released and keeps his buddy Tremor company. Ichabod – also believed to be a male. He is our newest burrowing owl who came to us in 2016.